If you would like to be able to author your own posts on this website, please contact me. Due to some bad experiences with earlier websites, I’m only allowing family members that I personally know to be authors at this time. Once you receive an email from this WordPress site like the following, click on the link and either accept the recommended random password, or give it your own password. Please limit posts to stories or information about Stan Matthews, his siblings, and his ancestors. Do not post any information about living persons, except Stan’s siblings in their early childhood years, and only then if the information is not personal, or disrespectful, or could cause concern or embarrassment for the living sibling. If in doubt, do not post it. Do not include any e-mail’s in your post…I did this in an earlier site and was spammed so bad I had to shut down the e-mail account. I have a secure contact form on the website so if visitors want to contact us, they can use that form and none of our e-mails are at risk. If I receive a contact that was intended for a specific author, I’ll send you a private e-mail on that. If your post only includes text, please add a “Featured image” to your post. This makes the post much more interesting and encourages visitors to view the post. Scroll down the post until you see “Set Featured Image” on the right side. 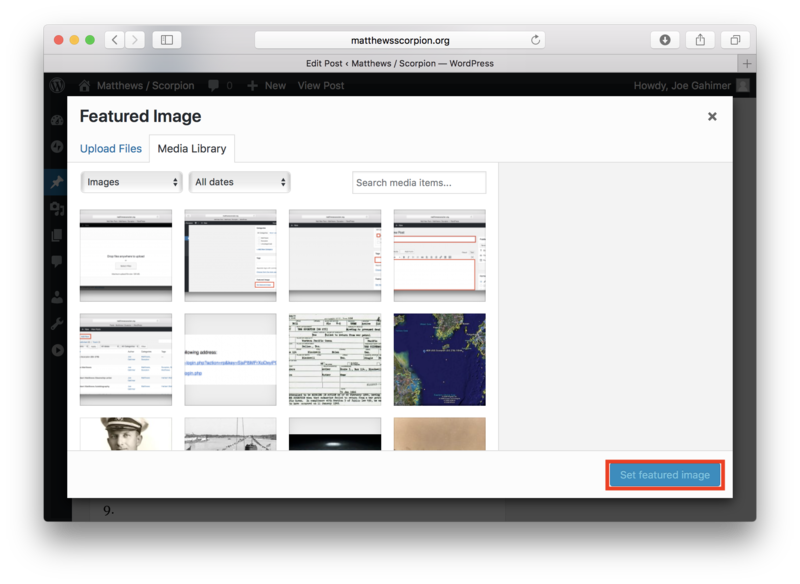 Find the image file you want to make as the primary image for your post (this will appear that the top of the post), and drag it onto the website area shown below. 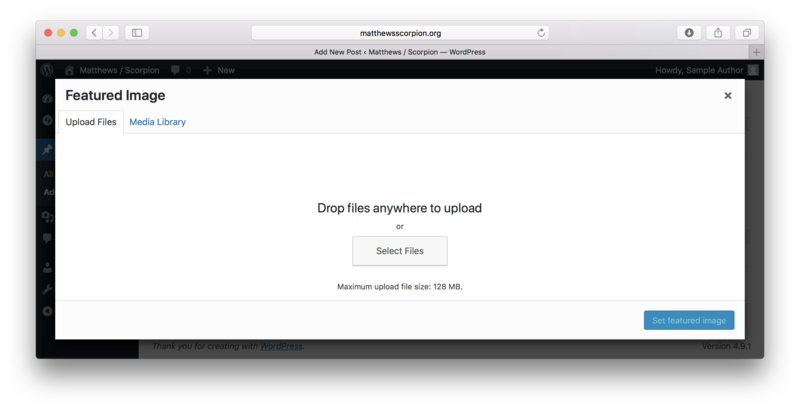 Once the file is done loading, you can click the “Set Featured Image” button. If you have a long post and want to save it before it’s complete, click the “Save Draft” button. You can return and finish it later. 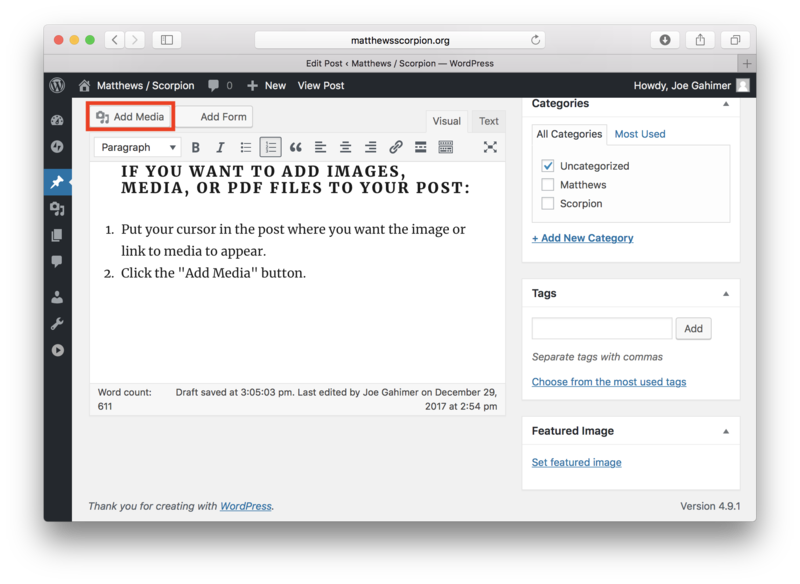 Once you’re complete with your post, click the “Publish” button. 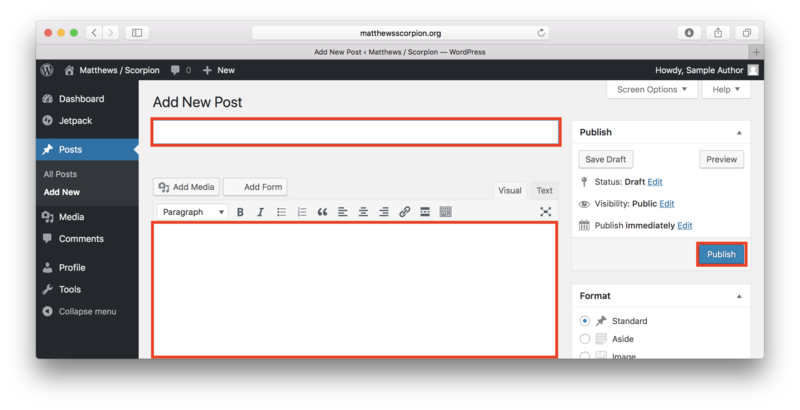 If you’ve already published and are making changes, the “Publish” button will change into an “Update” button. The information in your post will not be visible on the website for others to see until the “Publish” or “Update” button are pressed. On the post entry screen, scroll down until you see the “Categories” and “Tags” features. 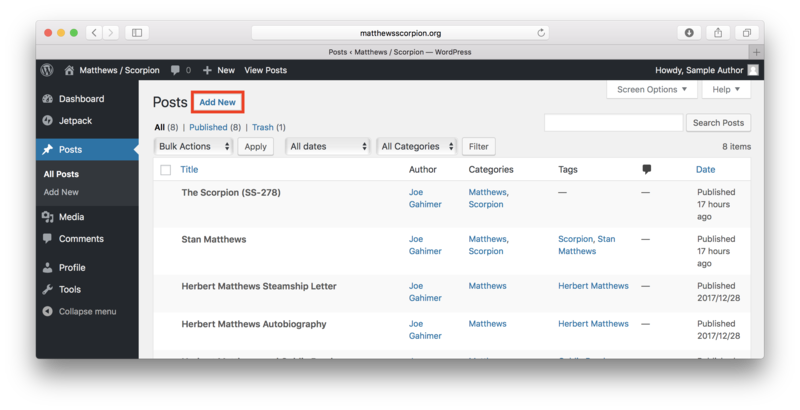 Categories: At this time, I want to limit categories to either “Matthews” or “Scorpion” as those visiting the site are typically coming for one or the other. The categories gives them an easy way to see just what they are interested in. 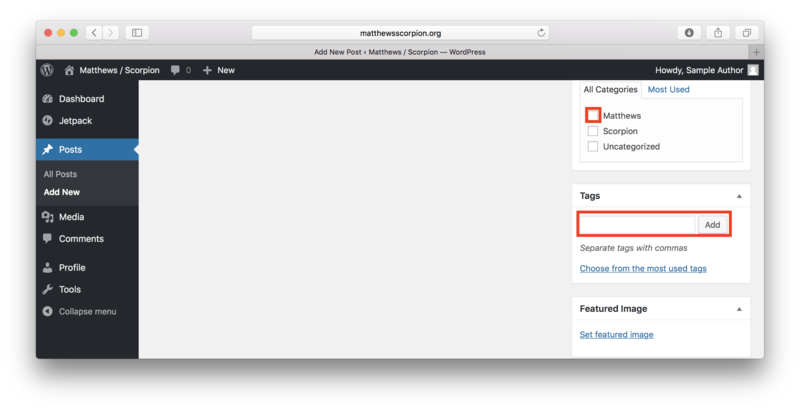 Select the “Matthews” category. Tags: At this time, I’m using tags to record people mentioned in the post. I’m using the tag convention of “given name” and then “family name”. For females, use the maiden name as this makes it much easier to find all entries. Separate individual tags with a comma. Here’s an example: Mary Matthews, Jim Matthews, Anne Matthews. 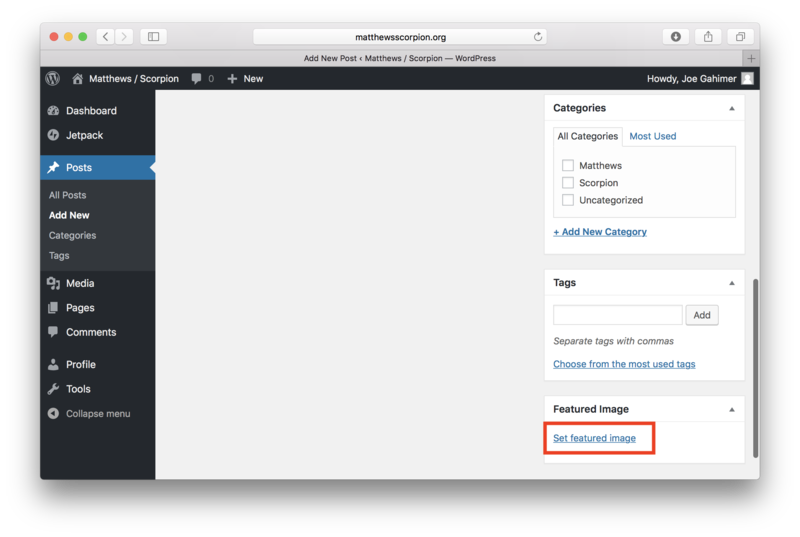 Put your cursor in the post where you want the image or link to media to appear. 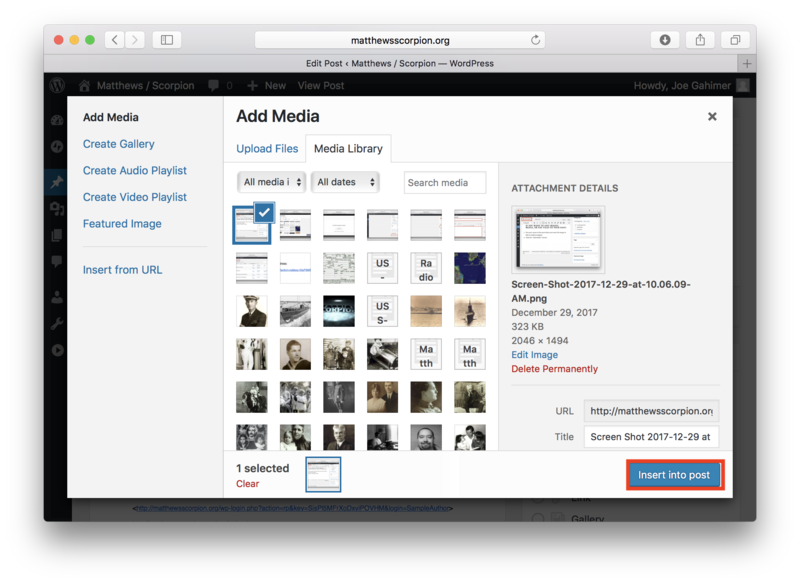 Find the file you want to attach and drag it onto the website area shown below. Click the “Insert Into Post” button.